There are few things in life I truly relish in this life like that of food which will eventually kill you. With Jalapenos. Oh Jalapeno your toothsome bite and Leprechaun skin makes me giddy. Be you pickled or fresh, I love you. You're so readily available. When I can't find Tears of Fire or a Bangalore Torpedo at one in the morning, you are there, reassuring me. You are the shaggy hound standing ever by my side. You are my best friend. Seriously though. I really like stuff with Jalapenos involved. Yeah, I like other hotter and more exotic peppers more. But, Jalapenos are just so prevalent. I also have a penchant for horrible fast food. I feel like that when these two items are cross bred they are destined for my stomach and all parts of me preceding and after. 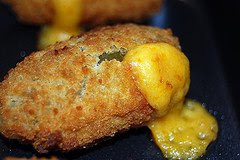 Probably my favorite fast food Jalapeno based item is the Jack in the Box Jalapeno popper. OMG! These are delicious. They come in a 3 or a generous 7 piece size which suits my preference for odd numbered items. They are coated in a crunchy batter and filled with molten cheddar cheese like and flavored, most likely dairy based goo. Heaven. Then you get the further pleasure of dipping these little bastards into Jack's ranch sauce. Normally I hate ranch dressing, but there's just something about this flavor combination......ahhh Umami! Another fast food item that I just love involving Jalapenos is one which sadly isn't even available here in California. 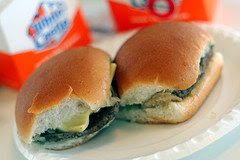 It is the venerable White Castle slider with pickled Jalapenos to give this classic staple of late night eating a bit of fun and flare. "Sack of Ten please!!!!!!" Luckily I get to have these beauties when I go visiting family in Minneapolis. When I lived there I never knew how good I had it. I lived a block away from a White Castle and I took it for granted. Oh the humanity you can find in a White Castle at 3 a.m., and the cheeseburgers too.